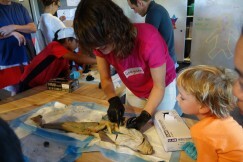 Helix, a Los Altos "community science center" run by the Exploratorium, will close its doors on November 30. The 5,000-square-foot space brought hands-on science exhibits, a classroom with ever-changing activities, and a museum gift shop to downtown Los Altos. Helix opened last November, less than a year after the Exploratorium moved to its new Pier 15 location. It was funded by a one-year grant from Passerelle Investment Co., which started in 2009 with the explicit goal of revitalizing downtown Los Altos. Passerelle and the Exploratorium have an agreement not to disclose the size of the grant or finances related to Helix, including gift shop revenue. 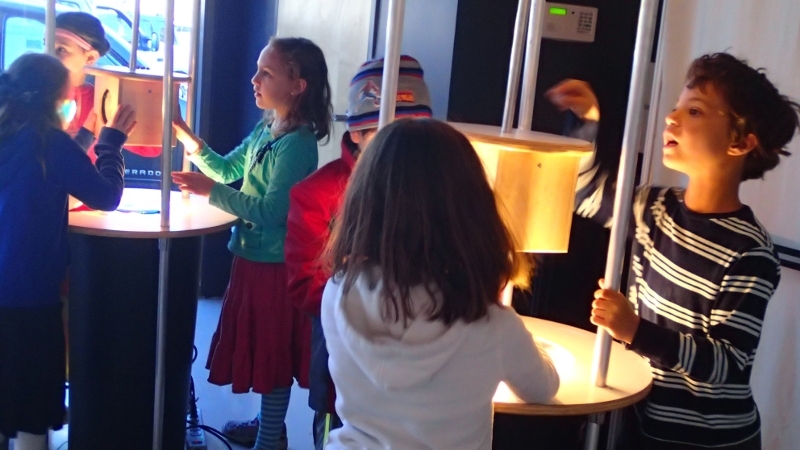 Over the past year, Helix has served up the Exploratorium's signature style of creative science education to 50,000 visitors, with a special focus on teacher workshops and student field trips. "I had never had anyone from a museum meet with me personally to design a learning activity for my students," said Cathy Moss, a teacher at Gardner Bullis Elementary School in Los Altos. Before bringing her 5th graders to Helix, she met with director Anne Richardson and explained that she wanted her students to use their knowledge of electricity to design real-world structures. Richardson created a project called "The Electric Playground," in which students "started by experimenting with circuits and then came up with an idea for some kind of playground structure that would incorporate electricity," said Moss. "We had electric slides, merry-go-rounds with motors, and lots of equipment with lights." Helix program manager Hashim Anderson said that supporting K12 teachers has been one of the Exploratorium's great strengths for many years. He and the other staff members, who are all Exploratorium employees, simply brought this expertise from San Francisco to Los Altos. "We’re not credentialed teachers," said Anderson, "but we’re all really good learners." Even so, it takes time to develop relationships with a new community. "I feel like we're just really gaining momentum and figuring out working with school groups," said Lea Frantti, one of four education specialists at Helix. "If we were here for one more year, or two more years or ten more years, there’s so much more we could learn." But that time isn't available, and Helix's two managers, four educators, and three retail workers will be soon be moving on. "Most of us were signed on specifically just for this project, so our positions are coming to an end," said Anderson. Helix's temporary sojourn is not unusual amidst several Passerelle-funded "pop-ups" in Los Altos, including a four-month visit from the San Francisco Museum of Modern Art. 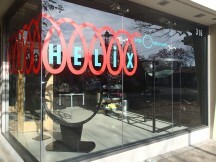 Helix, in fact, was prefaced by an Exploratorium pop-up in the summer of 2013. "We knew we’d get this grant at some point and we’d be down there for a year," said Anderson. Helix demonstrated certain advantages over the Exploratorium's huge Pier 15 space. With only 25 exhibits, visitors could easily spend plenty of time on each one. And Helix staff could frequently change displays and activities. "The same people were coming over and over; they enjoyed coming back every weekend and finding something different in the classroom space. 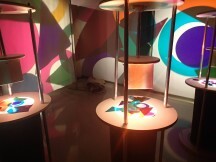 The Exploratorium can’t change things so frequently," said Frantti. "We got to work on so many different things. Every month we would pick a theme and create different programming and workshops around that." July, for example, was Monsters. Helix displayed the "found creature" photography of Adam Thorman; a book club discussed Carl Zimmer's Parasite Rex; and visitors learned anatomy from dissections of squid, dogfish, rabbits, and carnivorous plants. Frantti worked with the Bay Area Art and Science Interdisciplinary Collaborative Sessions (BAASICS) to host a Monsters Happy Hour on July 18th. Artist George Pfau discussed zombie movies and mythology, followed by scientist John Hafernik's lecture on ZomBees--ordinary honeybees that have been parasitized by flies. A morbidly fascinated audience clutched their wine glasses and beer bottles. Helix Happy Hours began in February, after staff noticed that parents weren't engaging with the exhibits--they either didn't pay attention, or thought they should already know everything. Creating 18+ evening events and serving alcohol made many adults feel more at ease to explore and learn. "This is the issue I have with the Exploratorium in general," said Anderson. "People think 'oh, it's a kids' museum.' Just because it's science learning doesn't mean it’s for a particular demographic. It's really for everyone." Helix is certainly offering something for everyone during its final weekend, November 28-30. The center's post-Thanksgiving program will include the year's "greatest hits," from dissecting squid to building a 3D fractal sculpture and playing with light and shadow. After that, the Exploratorium's first and only satellite museum will pack up and head home.